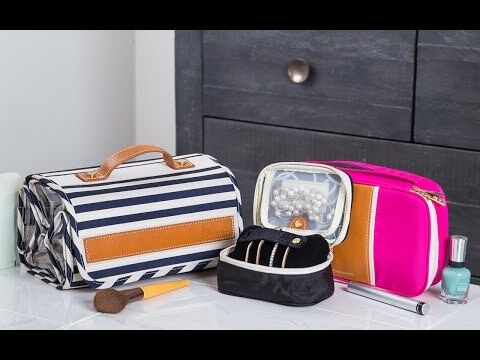 This cosmetic travel case gives easy access to makeup, brushes, and pencils, keeping them gracefully stored and organized. Instead of the regular deep style of most makeup bags, this one is shallow, with a top and bottom that keeps things right in view, while doing so beautifully. The water-resistant nylon exterior is trimmed with vegetable tanned leather and opens up to six internal pockets. Streamline your routine, with a touch of smart style. Have used this only once but it is well organized for my trips. It takes up less room in my bag which is a plus.